You're going to love our releases next February! Our most highly anticipated game release in years will be hitting store shelves, and you'll be getting a brand new Munchkin blister pack, full of some of the creepiest cards to ever grace the game! An all-new game set in the Munchkin universe! 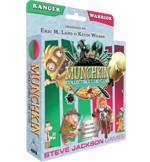 Designed by Eric M. Lang and Kevin Wilson, the Munchkin Collectible Card Game puts players in control of one of six heroes: the Centaur Warrior, Halfling Ranger, Human Wizard, Elf Thief, Orc Bard, and Dwarf Cleric! Hire Monsters to attack your opponent, and deal damage to defeat them! Defend yourself with Loot and Allies, and use Mischief cards to surprise the opposing player. But most of all: Bluff! The unique bluffing mechanic in Munchkin CCG means your opponent never knows what's hitting them until it's too late! Will they run? Commit a weapon? Catch you cheating? It all depends on how well you bluff! 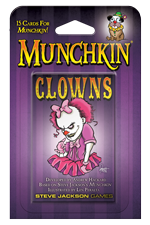 The Munchkin CCG comes out in February, but you can preorder it now at your local game store. Simply print our preorder form and fill out what you want. There are three starter decks to choose from, each with a different hero combination, and you can expand your game with randomized booster packs of 12 cards each! Clowns. Why did it have to be clowns? Real talk: I hate clowns. I grew up with clown paraphernalia around my room, as if my parents wanted to instill the fear of painted-face monsters in me at a young age. So now I'm trapped in an office full of Munchkin Clowns art by Len Peralta (Munchkin Apocalypse Guest Artist Edition, Bill & Ted's Excellent Boardgame). It's creepy. I mean, really creepy. Sure, the jokes are great, and you get 15 new Munchkin cards to add to any game, but just look at that clown! Only the most depraved Munchkin fan will want this blister pack. Oh, wait, that means every Munchkin fan will want Munchkin Clowns!